Based on the innovations of Master Geoge Xu (Xu Guoming), the purpose of this workshop is to completely integrate key concepts from Daoist ritual-meditation and “pure” internal martial arts. The strategies we use are empty and effortless, relying on whole-body liquid mass integration and momentum to create maximum gravity and unstoppable power. Using slight-of-hand (ling) and misdirection(xu) we seek to transform the relationship between spatial perception and action. Designed to help people see clearly what taijiquan does and how it develops over a period of many years. You don’t have to know taijiquan to take this class but advanced students will benefit from it. All forms and styles of taijiquan are welcome (Chen, Yang, Wu, etc..). We will present simple games and experiments that explore basic counter intuitive principles of taijiquan which are normally invisible to students. The core idea of taijiquan is to create completely uninhibited movement by freeing the way the mind and body interact. COST TO STUDENTS $100-150 DOLLARS A DAY, $60-75 FOR HALF DAYS. COST TO PRESENTERS $750-$1000 FOR FULL TEACHING DAYS - PLUS TRAVEL EXPENSES. LECTURE/SLIDESHOWS ARE $300 FOR 3 HOUR EVENTS, BUT FREE WITH A WHOLE WEEKEND OF WORKSHOPS. The presumption of this workshop is that freedom cannot be learned; however, the habits of freedom can be conditioned through play. The idea of Daoyin in martial arts, theater, and hermit yogas, is that emptiness can be discovered and verified in the “pull” between wildness and stillness. 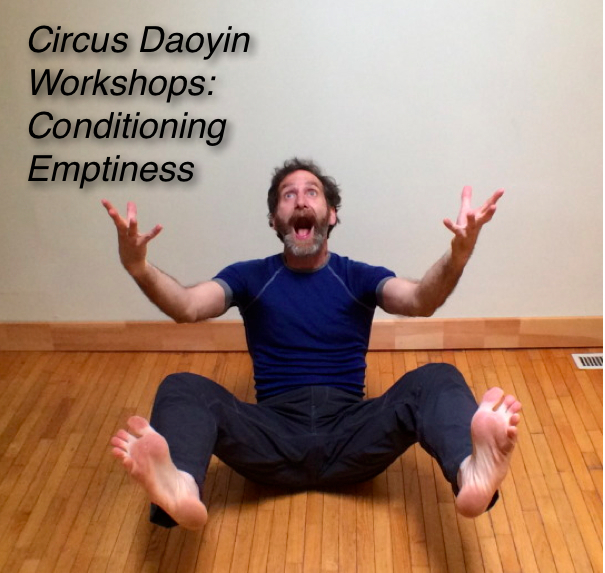 In this workshop we will deploy daoyin as twenty animals each with five elements in continuous expression and transition. This form of Operatic Daoyin comes from the animal stage roles of southern China, it is interactive and involves lots of rolling around and movement on all fours. This workshop is open to all levels of experience, loose clothing, a tail, and a sense of humor will be helpful. This Daoyin comes from Master Paulie Zink. I call it Circus Daoyin; it a theatrical path to enlightenment. AKA, Yoga for the Insatiably Creative. In this workshop we explore the original style which is historically linked to literati meditation practices. It is playful and perhaps even a little wild. The downward dog pose scampers about the room and wiggles his tail, the frog eats flies and accidentally lands on a hot brick. Another goal of this workshop is to open up new ways of healing your body and energizing your practice. Safe for beginners and fun for advanced students. Dance As Self-Defense--a completely new way of thinking about both martial arts and dance. All the fun stuff in martial arts put it into dance games. It’s the safe way to work with maximum momentum. Each game plays with principles of movement and perception through dance. We will learn the W.A.L.T.Z. (Warriors and Lovers Traditional Zeitgeist), and the S.A.M.B.A. (Situational Awareness Momentum-Balance Activation). These dance styles are straight-up short-cuts to advanced martial arts skills. One of the beautiful things about this practice method is it by-passes the normal emotional identity blocks people have, thereby giving students an opportunity to experience movement in new ways. If you would like to learn martial arts through dance, this is a great entry point. If you would like to bust your martial arts training out of its neat little boxes, this is the ticket. Or, if you just want to have a whole bunch of fun, this is the class for you! The purpose of playing games is to have as much fun as possible and to unleash spontaneity which is the only proof we have that we are not robots. When we get rid of fear and replace it with exhilaration, competitiveness melts away, leaving behind a joyful cooperative buzz that lasts for days. The martial arts skills we condition and test in games are the skills we trust the most. Traditionally folks retreated to the quiet mountains to meditate and find equanimity, but martial artists were rebel tricksters, who instead invented games that are sneaky down and dirty short-cuts to enlightenment. They are the quick and easy route to joyful comfort in our bodies, discarding limitation, and entering the Void via a secret door. We will particularly work with creating positive stimulation via soft hand slapping, unbalancing, and games that condition speed with relaxation and increase spatial awareness. Come ready to play, invent and develop ways to improve martial arts games. Bring your own funny bone, you may have the opportunity to hit someone with it. Almost any subject can be taught in the workshop format including Meditation Retreats, Qigong Seminars, Text Study Classes, traditional arts like Baguazhang or Xinyi, as well as Dance, Improvisational Theater, and anything described on the Styles page. This newsletter only goes out when there are new workshops scheduled or new publications.